Dearest, most wonderful and amazing Jesse.."The James"...you are gone for a time from our sight, but never our memories. You are gone for awhile from our hearing, but never our hearts. You are gone temporarily from our touch, but your presence is felt. The love and joy that you gave us will never depart. You were "the Man" to beat in the conformation, agility and flyball arenas. Prestigious conformation judges commented you should be "Specialed." You took Best of Breed out of the Bred-by class over multiple Specials! You amazed our flyball captain with your intelligence in competition by picking up your dropped ball and carrying it to the finish! 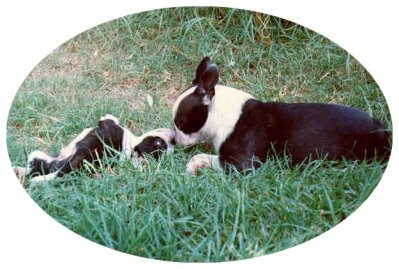 You became #3 Boston Terrier in flyball in North America. 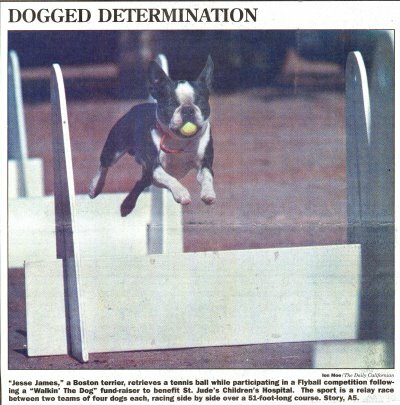 Your action flyball photo and story made newspapers. Your TV interview while held by Hal Clement was documented on Channel 10 News. You were so very proud..."the Man." 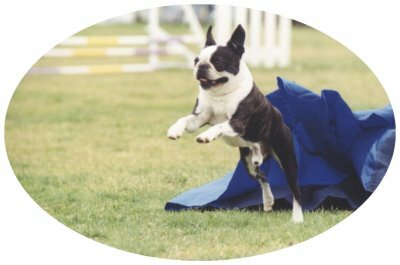 In 1999, you and Sandy flew to Rhode Island to compete at the Boston Terrier Club of America's first agility Competition at the Nationals. 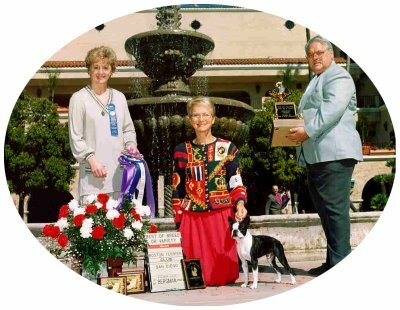 You won your agility classes as well as making the cut for Best of Breed in the conformation ring. Your fearlessness and friendliness took you to great heights, but also caused a tragic accident which limited your future, but not your mind. 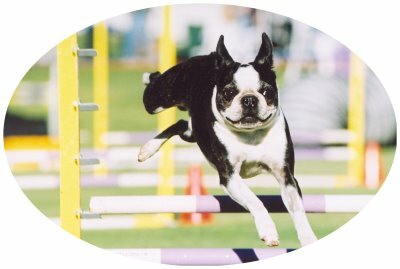 Despite your disabilities, your competitive spirit and sharpness brought you back into agility games with us again. Your speed and spirit was a handling challenge. You were always so exited to be playing (competing)--qualifying and placing with many 1sts--so awesome. You were our Don Juan, passing your great qualities to your offspring. You are still with us through your kids Katie and Janie. There truly will never be another like you Jesse 1 a real gift. You were an over comer-- a true Champion of the breed. We have peace knowing your never-ending pain is now gone and you are playing with those who have gone before you in the house of the Lord.